rlspt : some of the guys wanted me to take them through a neck reset, so here goes......... i'm doing a couple of resets right now, a 1233 12-string and a 70s 6583 x-braced jumbo sov. i already took both necks off, but i'll back up and go through the steps. i use an x-acto knife to carefully cut through the finish around the sides of the fretboard extension where it meets the top, and around the heel of the neck where it meets the body. this is just to prevent any of the finish on the body coming away with the neck, so the cut goes only through the finish. then i cover the area of the body around the neck with masking tape. i go 3 or 4 inches out from the neck toward the sides. this is to protect the top from scratching when i take off the fretboard extension, and to protect it from steam and water. next i remove the fret at the location of the dovetail joint that holds the neck and body together- the 13th fret on a 12 frets to the body guitar, the 15th fret on a 14 to the body guitar. it's the fret one toward the soundhole from where the neck and body connect. 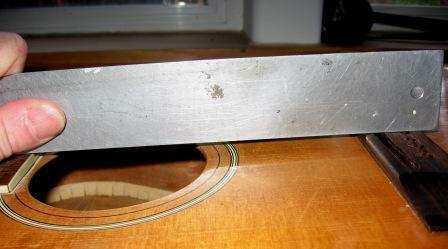 i use the blade of a chisel to pry up the fret. you have to be careful to take it out gradually and gently, but even then chips of fretboard may come up with it. once the fret is out, i drill a hole in the fret slot straight down through the fretboard. the hole needs to be big enough to accommodate the needle of the steam rig, but small enough that it won't show when the fret is replaced. 5/64" is what works for my setup. the hole needs to be as deep as possible too, so mount the bit in the drill for maximum depth. hopefully the bit will go through the fretboard and right into the spot where the end of the neck fits into the neckblock. sometimes the joint is slightly off the fret slot one way or the other, so you might need to drill through the same hole in the fretboard but at slight angles to find the sweet spot. usually you can tell when you hit it just right, there'll be less resistance to the bit going in. 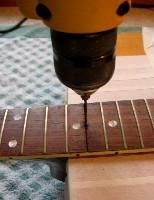 then i apply heat to the fretboard extension to loosen the glue that holds it to the top. in the tradition of kamikaze luthiery (getting the job done with stuff lying around the house) i use a travel iron that i got at goodwill. naturally stew-mac has a custom rig for this if you've got the money, but my trusty little iron gets it done. you have to find a temperature that softens the glue without scorching the top, not too cool, not too hot, the "wool" setting on my iron works great. i put scrap cardboard along the sides of the fretboard, to give some insulation for the top. i set the iron right on the frets and let it sit for 3 or 4 minutes, then start sliding a thin but stiff palette knife under the fretboard extension. a small putty knife could work, the criteria are: thin, fairly stiff, and preferably rounded edges that won't dig in or gouge. i like the palette knife because you can select the stiffness, it's got rounded edges, and the bend in the blade makes it easy to work with. once the fretboard extension is loose from the top as far as where the neck meets the body, i'm ready to steam off the neck. fanfab4 : Nicely explained with steps to follow. Steam iron interesting option. Cardboard is "taped" to neck to prevent damage to finish ? 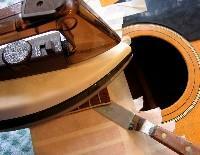 "use of a steam iron..." i use no steam from the iron when i use it to heat the fretboard. in fact the iron's water reservoir is empty & dry. you want the heat source you use for this to be dry heat, no steam at this point. "you tape cardboard..." this is something you CAN do, that isn't shown in the photos. i have confidence that my iron temperature is not too hot and won't scorch the top. if you weren't confident of the temperature, you could just lay cardboard around the fretboard to provide insulation for the top while heating the fretboard. i put masking tape directly on the top to protect it from the palette knife while loosening the fretboard, and the steam and water involved later in removing the neck. 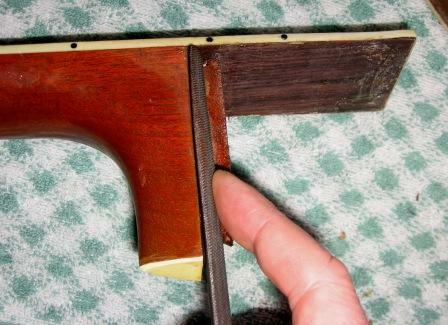 you need a source of steam to shoot down the hole through the fretboard into the neck joint. i've used a couple different rigs, homemade of course. my first was a plug-in coffee percolator with a hose rigged up to the top. it worked all right. the disadvantage was that it spewed steam continuously, you couldn't turn it off and on instantly. so i went to an espresso maker that i found at goodwill. i hooked the hose to the spout that steams the milk, which happened to have an outside diameter the same as my needle at the other end of the hose. it has a valve you can turn on and off. it works fine. i recently saw but haven't tried a rig that's made of an old pressure cooker with the hose fixed to the top. if possible, you want just steam and very hot air to come out the end of your hose, not a stream of hot water. the steam will quickly condense to water anyway. the less actual water, the better, in my opinion, because it will run out all over and can infiltrate and affect other glue in the neck area. the hose running from your steam source needs to be rated for high heat and pressure. i use automotive heater hose, available from an auto supply store or well stocked hardware. don't use hose that's not heat and pressure rated, it could melt or even explode. you don't want steam spewing about. the hose only needs to be long enough to reach comfortably from your steam source to the guitar, too long could allow the steam to cool and condense. mine is 3 feet long, and that's plenty. i could probably make do with 2 feet. so one end of the hose is attached to your steam source. it needs to be attached firmly, so it won't blow off under pressure. i use automotive screw clamps. the other end has a hollow needle attached that you can shove down the drilled hole in the neck joint. it's a needle that's usually used for inflating balls, available at sports or hardware. the threaded portion is shoved into the end of the hose, and kept in place with another screw clamp. keep lots of rags around and wipe off any water that escapes the hole. and it will. some may come out the top, some out inside the body, etc., etc. the more quickly you can mop up any excess, the less likely it is to damage the finish or swell exposed wood inside the body. 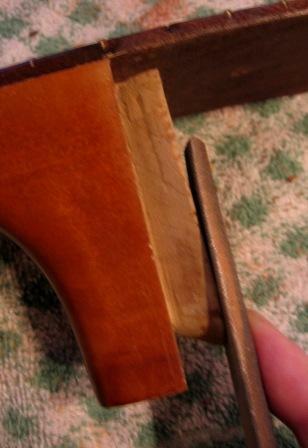 after a few minutes the glue in the neck joint will begin to soften and the joint become loose. you can wiggle the neck a bit to get steam/hot water into all parts of the joint. you can press on the bottom of the neck heel, trying to press the neck straight out of the body. don't put any pressure upwards or downwards on the peghead, this can break the neck heel or crack the body. the neck needs to come straight up off the body. stew-mac makes a wonderful screw clamp jig that applies pressure in exactly the right way. i'd love to have one but never laid out the bucks. you can tap on the heel of the neck, in fact i lay the guitar upside down on a couple of long pieces of wood, so they lie just to the sides of the neck and along the sides of the bridge, supporting the top but allowing some space under the fretboard. 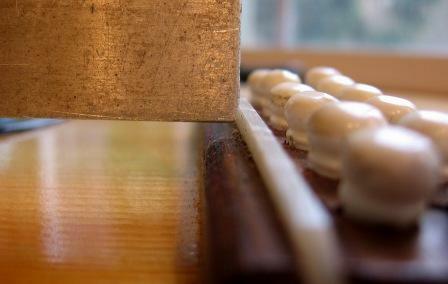 a light but sharp tap with a soft mallet will often dislodge the neck. jaydee : Awesome! Great photos. Wood planks to make a nice gap for the neck is a great idea, I'll do that. I'm looking forward to your next installment. fanfab4 : Laurie nice clean job . Neck came off very smoothly . I now see how your use of an iron to heat the neck joint from the body . That solves a lot of problems with possible damage to the top. 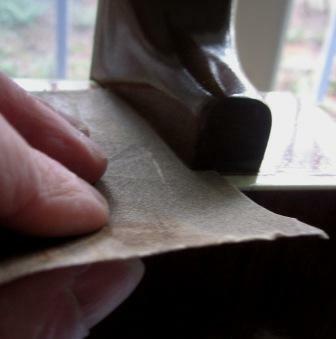 After the fret board is loose you then start with a steam source to loosen the dovetail joint . but eventually it did come off. just to let you know that sometimes they're tough and take some time and gentle persuasion. so next we need to clean all the residual glue off all the parts. obviously heat and water will dissolve the glue, and some folks prefer to use heat and/or hot water to get all the residue off, but i prefer to keep the procedure cool and dry, so my instrument of choice is a sharp chisel. i like to get all the parts clean back to bare wood, so when i reglue the joint i'm gluing wood to wood, and not wood to old glue. 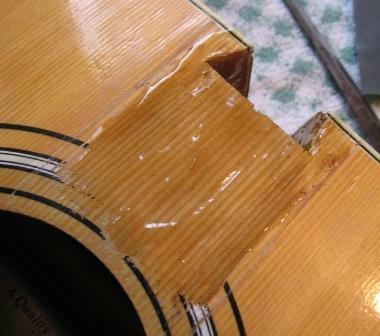 once the parts are cleaned up, i try reinserting the neck in the dry socket. hopefully it will go back in with minimal difficulty and without undue force. 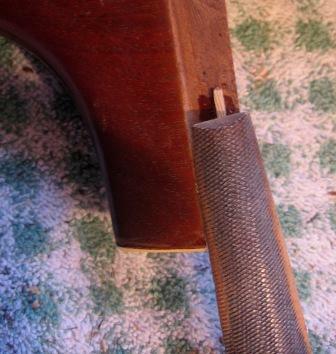 usually it will slide most of the way in, with maybe a tap or two with a mallet to reseat completely, with the bottom of the fretboard tight to the guitar top. if it doesn't want to reseat, i try to determine where it's hanging up, and GENTLY remove as little wood (like with a little sandpaper action) from the neck part of the dovetail joint to get it to fit snugly. i don't want it to be a major wrestle to get the dry joint back together, or to take it apart. the way i do resets, this taking off and putting back together is going to happen several, even many times, so i don't want to have to beat on it each time. but neither do i want the joint to be sloppy. trial and trial and hopefully no error. okay, so once the joint can be dry fitted and taken back apart without too much difficulty, force or frustration, we finally get to the meat of the matter, why we're doing this whole business......resetting the neck angle. 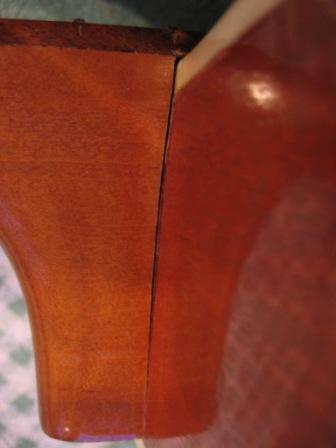 in order to get the neck at an angle that will result in good low string action, we need to remove some wood from the neck, specifically where the leading edge of the neck heel meets the body. if you visualize the guitar from the side, and imagine the peghead coming down to lower the action at the neck-body joint, it makes sense that we're going to remove more wood at the bottom of the neck heel, almost no wood where the neck meets the fretboard. some brave souls aren't afraid to actually saw or chisel away wood from the neck. 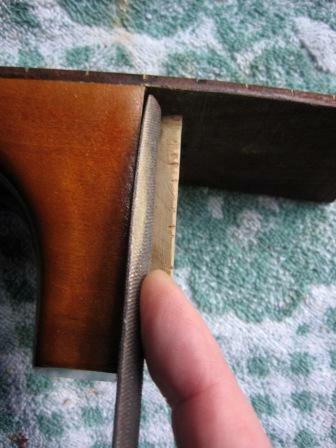 there are sites on the web that give formulas for how much wood to cut away from the heel to get the right string action. i am nowhere near that brave. so what i use is a flat file to take away the wood, a little at a time. this method is far slower than any trained luthier would accept, i imagine, but it does work, and i'd much rather creep up on the right amount than use a faster method and find i'd removed too much. so my file is just a standard flat file from the hardware store, nice and new and sharp. the one in the picture here is about 10" long and 1" or so wide. this one happens to have a rounded back, which is nice because the edges fit in tight spots. to remove wood from the neck, i'm just laying the flat side of the file against the end of the neck and filing away. a few strokes on one side of the dovetail, a few on the other side. refit neck to body, check progress. take back off, file some more. refit, check progress. take back off, file some more. that's the procedure in a nutshell. next installment, how to determine when you've taken off enough wood and can finally glue it back together and play the dang thing..
Bacon : Hey Laurie, do ya have to take any off of the male/neck side of the dovetail too (along with the neck heel)? rlspt : that part's coming up, kev. the next step (more like a series of steps) feels like it's going to be the hardest to describe. there are some nuances and subtle stuff that i feel like i'm going to have to struggle to articulate. Each new guitar should leave the factory/shop with the neck aligned properly, so that the height of the strings above the fretboard is low enough all up and down the neck to be comfortably playable, but not so low as to buzz against the frets. after years of string tension, the neck and body are subtly deformed. the neck may bow slightly, the top may sink slightly at the neck side of the soundhole and rise slightly at the bridge side. 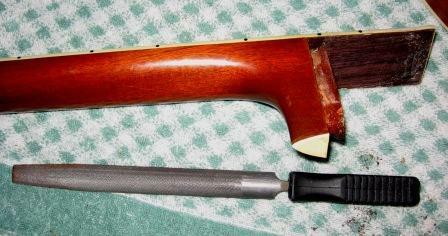 the eventual result is that the neck's peghead end tends to rise up relative to the body of the guitar, so the height of the strings above the fretboard gets higher and higher at the neck/body joint. eventually the guitar gets unplayable at the higher frets. if the angle of the neck has been pulled up and the guitar needs a reset, the straightedge will fall below the bridge's deck. here's a photo of that- the strings on this guitar are very high off the fretboard at the body fret. So...our aim in doing a neck reset is to get the angle back right, so that our straightedge lies flat on the frets and flat on the bridge deck. 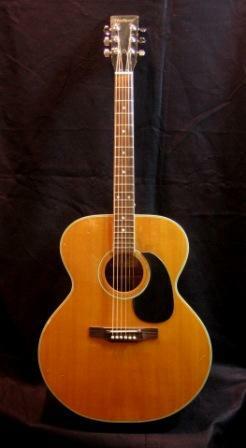 (some bridges on other brands of guitars are designed differently, with different heights above the top, but the statement above applies to all Harmony flat-tops i've ever seen). To correct the angle, we have to remodel the neck joint. 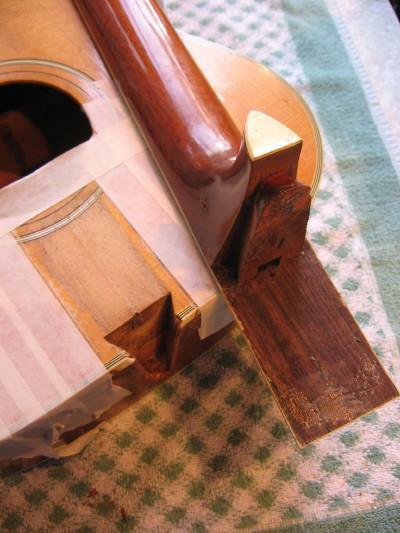 to do that, we have to remove wood at the leading edge of the neck, where it meets the body. 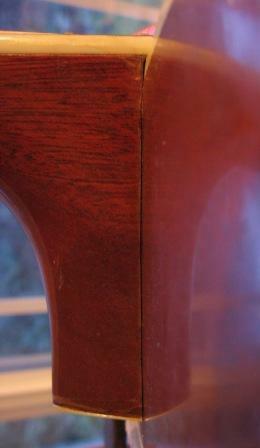 we will remove more wood at the neck heel, almost none at the fretboard. from the side, i visualize the point where the neck, body and fretboard all meet as the fulcrum, the crux point. in order to make the long horizontal line of the frets and bridge deck straight, we need to subtract a wee bit from the short intersecting line of the junction between the neck and body. in the picture below, i've laid a translucent plastic drafting triangle on the side of the neck to show what wood we're going to take away. this is a highly exaggerated angle; we're not going to take away that much wood, maybe 1/32", but i hope it does show the principle involved. Now, as for taking away that wood, it's back to the process i described, with laying the flat file against the neck heel and removing a bit at a time and refitting on to the body to check progress. if it appears that a lot of material needs to be removed, you could start with a rasp (a coarser file designed for wood), then go to a finer file. some folks prefer using a chisel throughout. then for the final exact fit, you can trap a piece of sandpaper (grit toward the neck, of course) between the body and the neck, with them dry-fitted together, and draw the paper out. 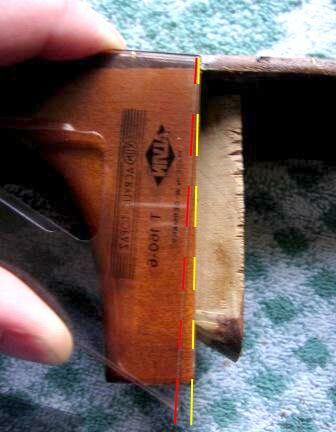 use increasingly fine grades of paper, and the fit of the neck to the body should end up being tight. only the outer edge of the neck joint needs to contact the body; the wood toward the dovetail is less critical and needn't be that smooth. Next installment, more about fitting the joint, guaging the angle, shims, etc. right now i need to figure out how to add arrows and text into my pictures before i post them. You can see that by aligning the fretboard with the bridge deck, it becomes obvious where we need to remove wood from the neck, and approximately how much. You need to be careful about several things at once here. be sure to file away the same amount of material on each side of the dovetail. if more comes off on one side, you may reset the neck out of alignment, so the strings end up out-of-parallel with the sides of the fretboard. so refit and check often. be sure the sides of the neck stay straight and lay flat against the body. you can see in the picture that my "flat" file has a slight upward bend at the tip, so i have to compensate for that. 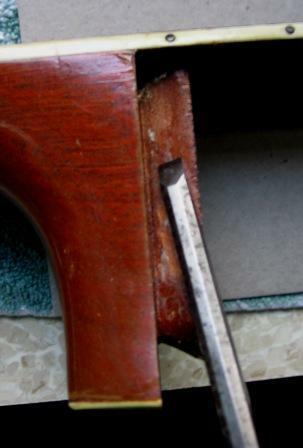 occasionally you'll have to file away across the tip of the neck heel, since when you file the sides down, the file doesn't reach the center of the heel. Now here's a step that i do, that would probably make real luthiers laugh, but i really like to make certain that the joint fits together perfectly when it's dry, before any glue gets anywhere close. the brave and confident among us could skip this step of temporary wedges and go directly to final ones. Once you can align the fretboard and bridge deck, using the straightedge as described before, with the neck dry-fit to the body (i even clamp it in place if necessary), there will be some slop to the fit. if you hold it in place with just your hands, when you let go the neck will move around a little and go out of alignment. so we need to fill the voids in the neck joint so when we dry-fit it, it stays where we want it and the fretboard stays aligned with the bridge deck. in other words, to lock the new neck angle in place. So i do this... with a little hide glue (more about that later), i stick a piece of a flat toothpick in the places where i think there's a void in the neck joint, and set it aside to dry. a little visualisation and some reasoning, plus just the feel of moving the neck around in the joint, will tell you where to place the toothpicks. if you get it wrong, no matter, just take it off and try again. most likely they will go on the back of the joint nearest the fretboard, and along the sides. think of the toothpicks as tiny wedges. the flat kind you can buy at the grocery are somewhat wedge shaped, they're what i use, and i glue them on with the taper in the direction i expect will fill the void. When the glue is dry, i try to fit the neck back onto the body, and file away the toothpicks as necessary to get the fit right. Soon, i should be able to dry-fit the neck to the body, have a nice tight fit, and have the fretboard align with the bridge deck (more about this later also). Then, sometimes, if i don't care much about the particular guitar, if the fit is fine, the gaps/voids are minimal, and i think the toothpicks are sufficient wedge material to withstand any crushing action the string tension might eventually generate, i'll reglue the neck. 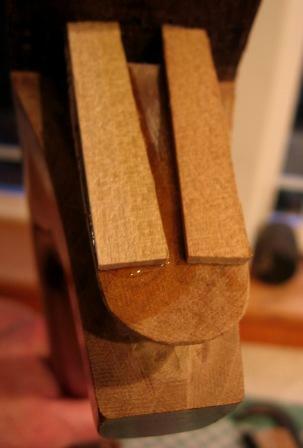 If, however, the gaps/voids in the neck joint are substantial, or if i'm planning on using heavy guage strings, or i just want to do a full and finished job, i'll take a look at the wedge shape of the partial toothpicks still adhered to the joint, and i'll make wider wedges out of a good hard wood (maple or birch work well). i try to make them about the same thickness as the partial toothpicks, plus a little. Then i chisel or file off the toothpick remains, and glue the wider wedges in their place. Then i file them away, checking the dry fit often, until....lo and behold! the neck refits to the body perfectly, with a nice tight fit, the fretboard and bridge deck plane out, a sight down the neck assures me the center of the nut and the center of the bridge line up, and, can you believe it, we're ready to glue it back together ! Sometimes the toothpick trick won't work because the voids are too big; in that case i use whatever thicker scrap wood i've got lying around to glue in as my temporary wedges. i've even used pieces of stiff solid cardboard (like from a shoebox, not the corrugated kind), glued in with super glue, when i was in a hurry. it filed away okay, and held the joint firmly, and was easy to remove when i'd determined from it what thickness permanent wedge i would need. for these temporary wedges, basically anything that will go in and come out easily and give the right thickness should work fine. I try to leave a void down the center of the joint: in the picture above you can see i've used two wedges, one down each side of the back of the dovetail, instead of a solid wedge going all the way across. that's so the next resetter (could be me if i've screwed up somehow) will have a straight shot with the steam needle right into the center of the joint. 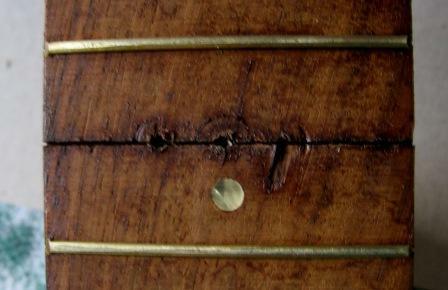 Usually, on a six string flat-top, aligning the top of the frets with the top of the bridge deck works fine. 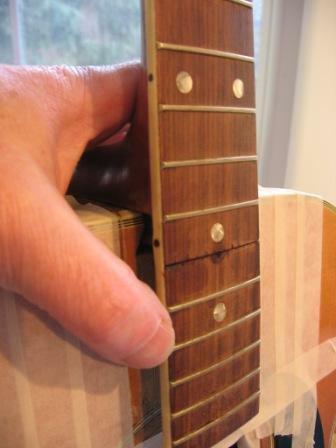 Be sure your straightedge is long enough so that it's contacting the tops of as many frets as possible. if it's too short (like 12"), you may be aligning the higher frets with the bridge, but not the ones closer to the peghead. actually we'd prefer to ignore the fretboard extension (frets 16 thru 19/20), and concentrate our attention on the frets on the fretboard from peghead to body. for that, an 18" straightedge is about the minimum, and longer is better. Also please note we're talking about the straightedge resting on the frets, not the nut, and on the bridge deck, not the saddle. Also note that when we've corrected the neck angle, the end of fretboard extension may not contact the top now. 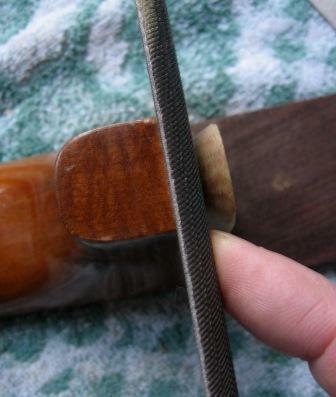 it may be necessary to clamp it down to the top at the soundhole when dry-fitting to get it out of the way of the straightedge. also when we re-glue the neck, it will be necessary to reglue the fretboard extension to the top of the body, and there well might be a downward bend in the fretboard from the neck-body joint back to the soundhole. this is fine and to be expected- we are re-aligning the frets that we actually play with the bridge, and that bend is the price we pay. the alternative is a tapered wedge of new wood under the fretboard extension, and some folks prefer that, but i've always found it unsightly. - the neck seemed more limber, more likely to pull up under string tension. 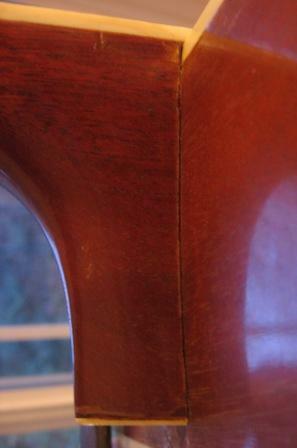 some of the 70s harmony "slimline" necks might qualify. - I expect to want to use heavy strings, that might exert high string tension. In these cases we're kind of "overcorrecting" the neck angle. If we overcorrect, but not too much, the worst case is we'll need to have a tall saddle. If we reset with not enough correction, we may be looking at redoing the reset. not the end of the world. probably the worst case scenario is if we wildly overdo the neck angle, so that even a super tall saddle won't give us enough height to align the strings with the fretboard. this is the best argument for my try, retry, check, recheck approach, so that we move toward the ideal angle by small degrees, and dry fit with wedges until the angle is right where we want it. This is one of those areas where experience is invaluable. 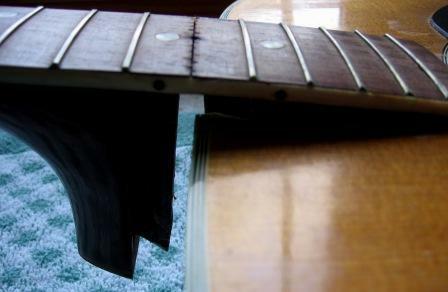 i'd suggest sticking with the basic "align the frets and the bridge deck" for the first attempt at a reset. 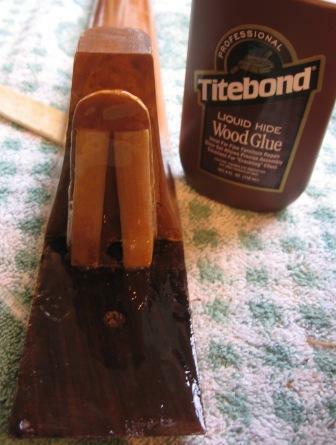 About glue - I use titebond hide glue that comes in a bottle from the hardware store. real luthiers use hide glue that they get in flake or powder form from stew-mac and cook it up in a smelly pot to a precise temperature. then they have a short time to spread, join and clamp, because the glue kicks off quick and sets in minutes. 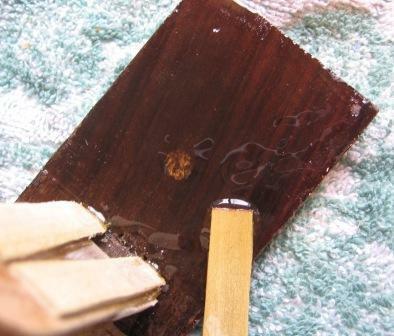 hide glue has been the standard for use in luthiery for centuries. the titebond i use is real hide glue, but they add a retarder so the set time is slower; you have half an hour or so before it sets up. also you can use it straight from the bottle, no heating required. they also add a fungicide or the like so the glue doesn't spoil. i have heard real luthiers say they don't like it, they say it's weaker than the real stuff and they don't trust the shelf life issue, yadda yadda but....it works for me. the bottle has a sell-by date on it, i don't use it after it's outdated. you can also use yellow (not white) woodworker's glue. it also has a longer "open" time so you have time to get everything all lined up before the glue kicks off. it's strong and works well. the problem with it is in re-doing operations- when you apply heat and steam, it tends to get gummy and messy, harder to deal with than hide glue. ...and all over both mating surfaces of the neck joint itself, with a generous dollop right down the void between my wedges. I'm pretty free with the glue; when i apply clamps any extra is going to squeeze out, so keep lots of damp rags handy. Then i fit it together and clamp it in place. I like this arrangement of clamps because i can wipe away glue that oozes out along the sides of the fretboard, and i can also run my straightedge right down the center to test my alignment one more time. 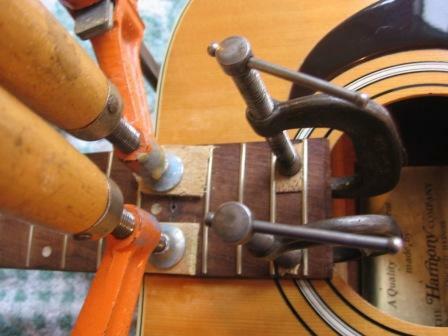 note the use of little scraps of wood between the clamps and the guitar itself. though it doesn't show in the pictures, there's a piece under the clamps protecting the back of the guitar too; i use wooden paint paddles they give away at the hardware. The next step may be the toughest of all: wait for the glue to dry. i usually give it 24 hours before i take the clamps off. then it's just tap the fret back into place, string it up and PLAY IT ! I"M WAITING FOR THE GLUE TO DRY. I usually take the nut off before i do a neck reset, only because my straightedge is long and sometimes it's a hassle to work with the nut in the way. i also adjust (usually loosen) the trussrod before i start, so the fretboard is as straight as possible for the straightedge to lie on. it just gives me one less variable to try to keep in mind as i go along. I probably forgot some other stuff; feel free to ask if something's not clear. i'd love to hear about your experience when you do a reset, and i'd especially like to hear tips or tricks you all have that could improve or speed up my own process. Norm, who's a member here on the harmony forum and an actual real live luthier in real life, sent me some e-mails with comments on this thread, and gave me his permission to post them...........thanks norm! I've been doing this sort of work for a very long time! It sounds like you have your act together, but I just have a few comments. It really isn't nessesary to cut through the lacquer around the fingerboard extension and the heel as the factory applied the finish on the neck and the body before they were assembled. This is the case with Martin, Harmony, Gibson etc. Most Asian imports are finished after assembly- and usually with polyurethane, and Guild also finihed the neck & body together after assembly. A real pain in the but! Flush ground nippers work a lot better for pulling frets- Stew Mac and LMI sell them that way but it's easy enough to modify regular ones from Lowe's or wherever- and a lot less expensive! I've beaten a few guitar necks off with a few blocks of wood and a mallet, but a screw type fixture like the one Stew Mac sells is a lot more gentle! Not difficult to make, either! I live in southeastern PA, just outside Philly, so the vast majority of the work I get around here is Martin. I cringe at the idea of getting a mallet anywhere near a vintage D-18 or whatever!!!! It amazes me that there are so many 'professional luthiers' who will do anything to avoid doing a neck reset, like shaving down the bridge! (Isn't that like letting air out of your other three tires when one goes flat?) I've done a lot of Martins that someone has done that to- about a year or so after the bridge is shaved to thin, it cracks- so I get to replace the bridge and re set the neck! Nothing can wake a guitar up like a proper neck re set! ......steam- I've tried a lot of things but I've settled on a a pressure cooker- a reallly serious pressure cooker with a pressure gauge- and I max it out, letting it get up to about 250 degrees- close to the 'danger' zone on the gauge. I let it run like that untill the needle stops spitting. The more heat and the less moisture the better. There's less risk to the finish and less possibility of swelling the dovetail in the process- a real issue on old Martins to be sure- less of an issue with Harmonys. Your Idea of masking off adjacent areas with tape had never occured to me, but it seems like a great idea so I'm gonna try it !!! I haven't really explored much on the Harmony board lately. I'm a lot better with guitars than I am with computers! I love sharing the 'deep dark secrets' of instrument repair! 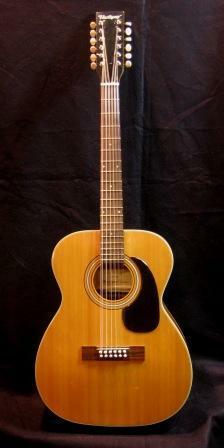 I also love old Harmony Guitars! I have a few nice ones, but they are all in need of work that I never seem to be able to get around to. Fixing your own guitars doesn't pay very well! Of course, they were all purchased under the pretense of repairing and reselling - like that's gonna happen! I have a nice 1260 Sov that's in the middle of a neck reset etc., an H1311 (Blonde Brilliant Cutaway) That the back is off and needs the world, a 1407 Patrician that needs a re set and a new truss rod, an H168 that also has a broken rod & needs a reset, a black Roy Smeck flat top with a bolt through the heel and some other guitars of questionable lineage. I play Dobro in a band called 'North Branch'. Strictly square neck/lap style with the band. I play guitar etc. also, but my left hand doesn't work very well anymore due to a stroke that hit me a few years ago. As far as posting my emails etc. I have no problem with that at all. Feel free to quote me, cut & paste, whatever! Here's a little nugget you might find helpful. Harmony guitars were made from the getgo to have rather high action. They didn't want customers complaining about buzzing! The nicer ones, Sovs, Patricians etc. have excellent necks and can be set up with low action but there's a bit of a catch on the flat tops. The bridge location is about 1/8" too far back to set up one with low action and have it play in tune. With the arch tops it's no problem- just move the bridge! On the flat tops I add a little wood to the leading edge of the bridge and move the saddle slot forward. I also use an 1/8" bone saddle instead of a 1/16" saddle as Harmony used on most of them. The 1/8" saddle gives you enough room to move the witness point for the 'B' string back enough to really get the guitar intonated correctly. The hardest part of the procedure is finding a hunk of Brazilian rosewood that matches the bridge close enough to go un noticed. I could make new bridges, but the 1260 style pinless bridge would be difficult to reproduce. Norm : I've used liquid hide glue, but I'm not crazy about it. The first pitfall is that, unlike cooked hide glue, it has a limited shelf life, even sealed. If it's past it's shelf life, it will not cure !!! As far as modern glues are concerned, I rarely use epoxy, and only as fill. I use CA (ya know, superglue...) for closed cracks to stabilize them (particularly on necks) as the thin stuff penetrates very easily. I also use CA for frets that don't want to stay seated, carefully letting it run in under the fret from the exposed edge of the fretboard on unbound fretboards. 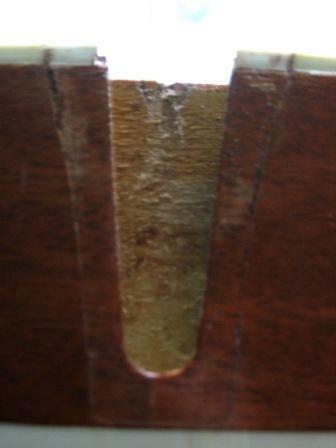 On bound fretboards, I'll remove the fret and carefull put a little in the slot before reseating the fret. 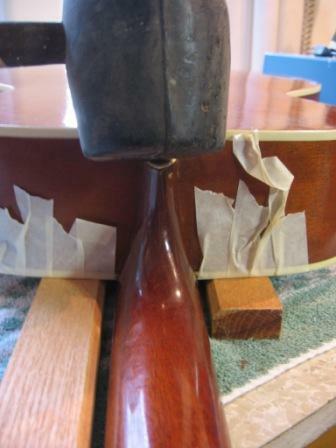 Gorilla glue is great if you have a piece of wood that has broken with the grain and you want to make it one piece again, like for instance, a heel or headstock cleanly broken of a neck. For assembly I use Titebond almost exclusively. I almost never use hide glue, and only cooked, because I just can't stand the smell and it sets up so quickly that I'm not fast enough to get things line up before it sets! Separating joints done with any hide glue is easy, as you know, and alphetic resins (Titebond etc,) are no problem, even Titebond III which is just about impervious to moisture. Epoxy softens with heat, CA's soften with Aceton (Sometimes it takes a lot) but Gorilla glue as well as other brands of polyurethane glues don't seem to soften. EVER. 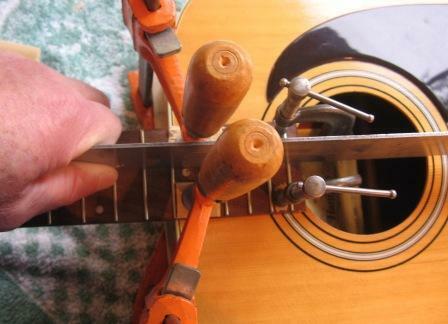 As far as your recalcitrant fingerboard extension is concerned, I would suggest an assortment of very thin, very sharp spatulas and lots of patience to shear the fingerboard from the top. 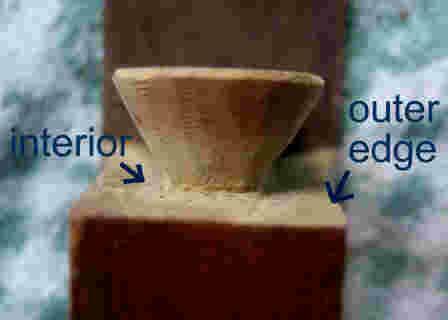 You probably know how to read the 'runout' of the grain of the top. It's best to observe that and start at the end of the fretboard on the side with the runout going away from you, just like you would to remove a bridge. If you aren't sure of what I'm talking about, Dan Erlewine's book explains it beautifully. If you don't have Dan's book I would strongly recommend getting it. Stew Mac sells it. I've also seen it at Borders and Barnes & Noble. "The Guitar Player Repair Guide by Dan Erliwine." Cutting the board doesn't really get you there as it will still prevent the dovetail from coming out. 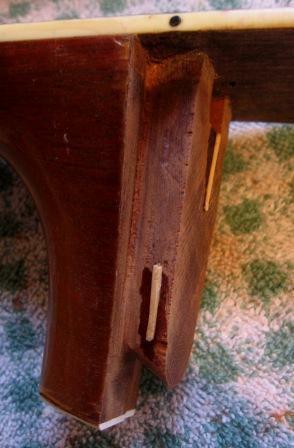 If it is Gorrilla glued and you find that with the fingerboard separated you can't get the dovetail loose and you suspect that Gorilla glue was used in the dovetail as well, it may be possible to break the bond by employing the 'two wood blocks and a mallet' technique. Gorrila glue is extremely brittle and seems to have poor 'shear' strength. Thankfully, I've never run in to this situation, so I've never done it, but it's the only way I can think of !